A current trend in burglaries is the “distraction burglary”. On 01/17/19 at approximately 3:25 pm the Gloucester Township Police Department responded to a report of an attempted theft/ suspicious activity call in the Blackwood section of town. Two Hispanic male subjects convinced a senior resident that they needed to check the “receptacles” in the circuit breaker box for “leakage”. One subject was upstairs claiming he was checking light switches but was overheard opening drawers. Burglars are always finding new tricks and methods when it comes to burglarizing a home. Distraction burglary is where a “visitor” comes to your home, tells you a lie to swindle their way into your home, or creates a ruse to distract the victim so an accomplice can slip in, which is the most common method. The most frequent target for these distraction burglaries are the elderly and vulnerable. The “Visitor” may pose as a sales person, utility worker, or person in need of help. The point of the distraction is to draw you out of your home or to a certain part of the residence while a second accomplice who is never seen by the homeowner enters the house through a secondary door or window to remove items from the home. 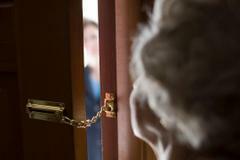 The average victim of a distraction burglary is 81 years old. If you are not sure who the person is at your door or you are not expecting visitors, DO NOT OPEN THE DOOR! **Our Anonymous Tip systems are NOT monitored 24/7. All incidents in Gloucester Township requiring IMMEDIATE police assistance please dial 911 for a police emergency and for a police non emergency 856-228-4500. If you have an EMERGENCY or are witnessing a CRIME IN PROGRESS, CALL 911.